According to the WorldatWork’s annual Salary Budget Survey, survey participants are planning a slight rise for salary increase budgets to 3.1 percent for 2018, up from 3.0 percent this year. With a tight job market, low unemployment, inflation seemingly under control, and reported employer financial gains, a larger growth in salaries might be expected. There are other factors that might explain the plateau in growth, including the increased use of variable pay and the use of non-cash rewards, or an overall more conservative pay philosophy. It is also important to keep in mind the impact of several important regulatory actions have had on salaries: the rising minimum wage in certain regions and the overtime rule. It’s entirely possible that these changes have not been reported as a salary budget increase in some cases. While the overtime rule has been blocked, many organizations had implemented the changes and chose not to undo them. So the picture may be brighter for the workforce than it appears. Keep in mind that salary increase budgets may vary by industry and geography location. The WorldatWork survey showed this year that there was little variation between states, ranging between 2.9 and 3.1 percent. There appears greater variation by metropolitan area, ranging from 3.0 to 3.3 percent. Highest budgets are reported by high-tech areas. Base salary increases are being awarded to 89 percent of employees in 2017. Promotional increases were awarded to 7.9 percent of employees in 2017. The size of the average promotional increase remained unchanged at 8.4 percent. The percentage of organizations using variable pay increased by one percentage point to 85 percent in 2017. This increased use of variable pay has been seen for several years and likely reflects organizations looking to further their pay-for-performance philosophy, without adding to fixed costs. 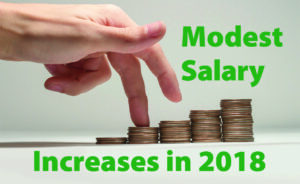 Employees are still seeing increases in pay through improved variable pay plan payouts. As we have reported earlier, employee retention is a significant concern to many employers. It appears that efforts to retain workers, particularly high performers, high potentials, and critical skilled workers, may need to be ratcheted up. From findings of a study by Spherion Staffing, employees seem more willing to test their options. The study reported that 25 percent of workers planned to look for a new job in the next three months. At the same time, 35 percent plan to do the same in the next year. With an improved economy and overall job market, employees believe they have more options available. As such, they believe they can demand a higher salary from their current employer or a competitor. Twenty percent cited compensation as the primary reason they plan to explore their option, more than any other employment factor. Some workers believe their employers do not appreciate their contributions, making them more likely to move to a new company that will. Feeling undervalued topped the list of non-financial factors workers gave for their interest in exploring alternative job opportunities. At the same time, 23 percent of employees felt their organizations were putting less effort in to retain them than last year. Please contact me at (847) 921-2812 or at nlappley@lappley.com to discuss planned compensation actions for 2018 and forward this email to anyone who may also be interested in these projections.